Asking for the presence and power that only the Holy Spirit provides. The Holy Spirit and our need for Him to supernaturally take over. This song is a prayer for change, and a revival of what has been lost and needs to be restored in the believer's heart. Asking for the manifest presence of the Spirit among God's people. Calling on the Spirit of God is God-glorifying. And it is counter-intuitive, because the natural man says, "I'll do it myself, thank you." 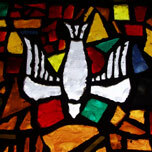 Ultimately, the Holy Spirit intervening is our only hope of lasting change. Water is lifegiving. And by the Spirit, we are promised a well that not only springs up inside us, but then overflows out of us, enriching everyone we meet.